Hey guys, Freya here with a review once again. But this time it’s special, since I’ll be reviewing a game instead of an anime for once. So sit back and enjoy reading. 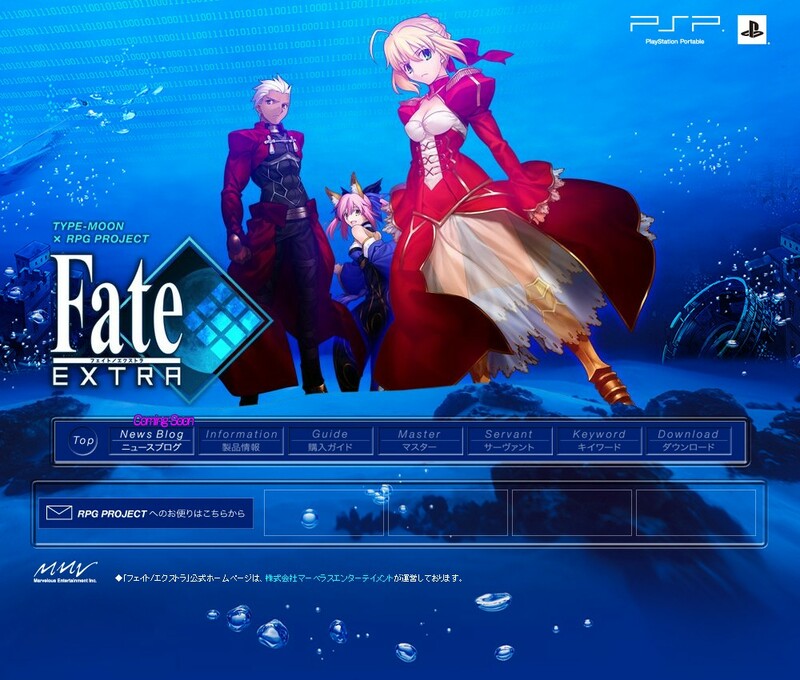 Fate/EXTRA made me curious about giving it a try since I’ve been a lover of the Fate/Stay Night franchise and I have to say that this PSP game is one of the best I’ve played. Fate/EXTRA no longer follows the Fate/Stay Night storyline but instead, it’s in a different point of view where Shiro isn’t in the game at all. Some characters I still remember who are in the game are Sakura, Shinji and Rin. The first half an hour of the gameplay was weird for me as I was supposed to do nothing but go from destination to destination in order to advance in the story, no action or much interaction was needed but some cutscenes did frightened me since the Fate series has ‘Thriller’ in their genre so I supposed the creators do not wanna change that genre at this point. 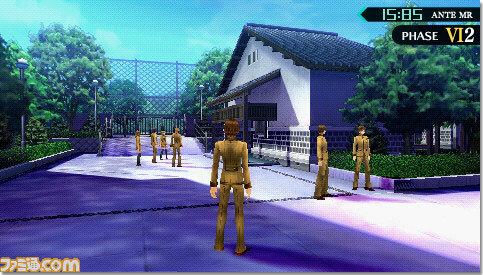 From the start, I had problems with this game as it was like a ‘Guess and Check’ game for me since I couldn’t read Japanese and so I have to focus on the keywords, they’re mainly names of the rooms or places you have to go to advance. After much hardwork I find my character dead, and I soon realised it was part of the story advancement so this made my mindset think that the game’s pretty tricky. Sometimes the player has to be aware of the answers he choose, it can lead to a DEAD END and soon GAME OVER. Fate/EXTRA is a different type of RPG I’ve played before, you get to choose your servant’s after the first character’s death and I managed to get Saber, who was my favorite all along. This game mainly runs on luck, since it’s like a game of scissors, paper, stone as you have to choose between 3 options before the attack turn between you and your enemy starts. There are 6 slots and the 3 options you can fill in are Attack, Block and Break. And what’s interesting is that if your level is higher than the enemy’s, you’ll be able to see which option the enemy is going to choose for which slot, giving you the advantage to counter. There are equips, items and skills of course, although I’ve yet to unlock much since I’ve not advance through the game much either but one thing to point out is that you can add points to different abilities (Spiritual Hacking) and they can change the advantages of winning a battle. Nonetheless, it’s extremely fun and awesome. 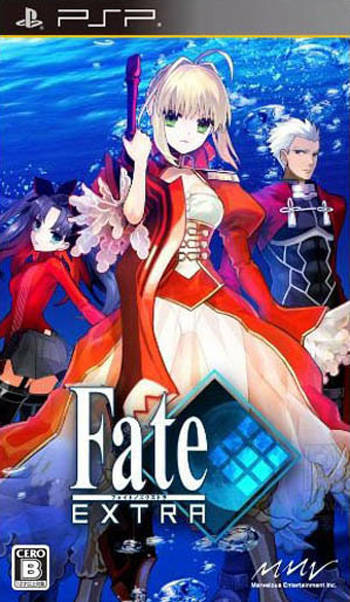 The graphics aren’t bad or too good either, as the art has changed a lot and now Saber and Rin looks different, as you can see on the game cover itself. This brought a little disappointment but I soon recovered after seeing the effects of the battles and the environment designs, they were brilliantly done and well created. There isn’t much music in Fate/EXTRA and the voice acting was a bit of a letdown actually, there wasn’t much talking for the dialogues and even if there are, the voice actor/actress has changed. It took me a while to adapt and get used to Saber’s new voice, and Rin’s too. But the sound effects during battle was good enough. 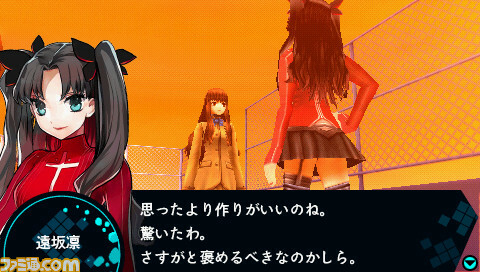 Fate/EXTRA was surprisingly enjoyable to play, although it might get frustrating for me at times when I can’t figure my way around due to the disability to read Japanese but I’m sure those who can read the language is sure to be able to enjoy the game thoroughly. But nonetheless, I enjoyed the game and battle styles a lot so it was worth playing all along. I have a feeling I rated this game a little too low, but what matters is where the game stands out. Its more advantageous side is the gameplay and storyline so those who do not care about sound or graphics, this might be the game for you. So what are all of you waiting for? Get this game now and try it out. This review was brought to all of you by Freya, check back for news, updates and more stuffs to add on.